For this month's Creative Challenge the MFT Design Team is having some fun with our fabulous Cork Sheets. Our packages of cork contain six 6"x6" sheets of 1/16" cork. They cut perfectly with our Die-namics. If you haven't tried them yet, you should! I have two cards to share with you today. The first one is a sweet Christmas card. 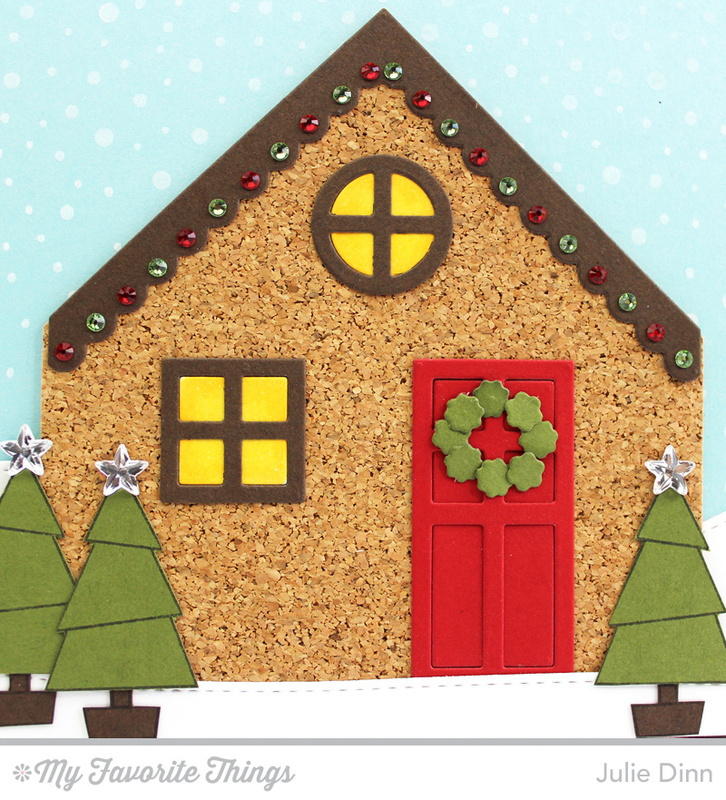 I grabbed the Home Sweet Home Die-namics and created a cork house. I love the textured look the cork sheets give to the house. The house is decorated for Christmas with traditional red and green Christmas lights and a holiday wreath on the door. The trees were stamped with the Jingle All the Way stamp set. These trees do have a coordinating die, but I decided to fussy cut them. 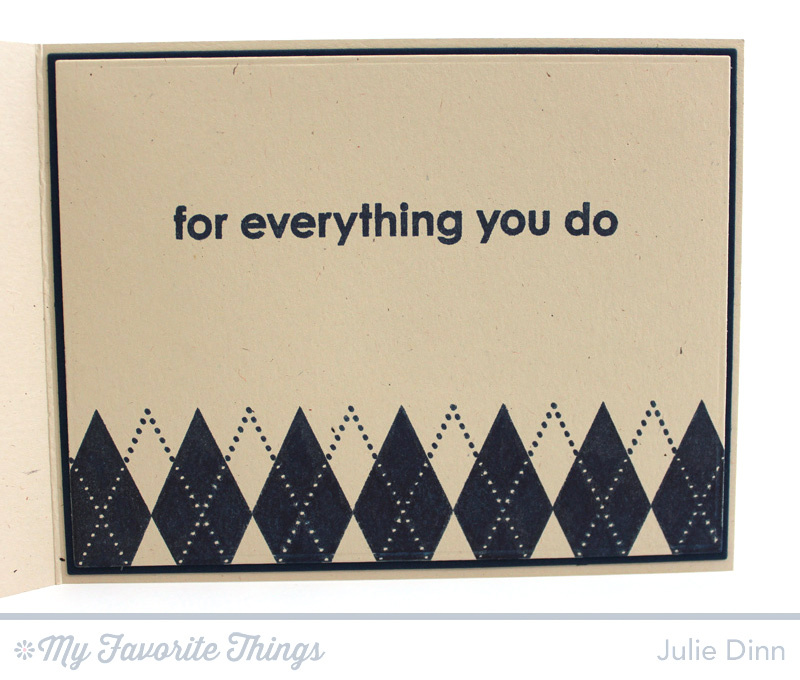 On the inside of the card, I stamped a sentiment from the Merry Messages stamp set. I also stamped the background with the Snowfall Background. I just LOVE this stamp! My second project is a quick and simple masculine card. I stamped an argyle strip from the Diamonds & Dots stamp set in Nightshift Blue Hybrid Ink. I die-cut a piece of cork with the Many Thanks Die-namics. Before I die-cut the cork I added a piece of adhesive paper to the back of it. Having the adhesive already attached to the cork makes it easier to ensure that the entire word is fully adhered to the card stock. 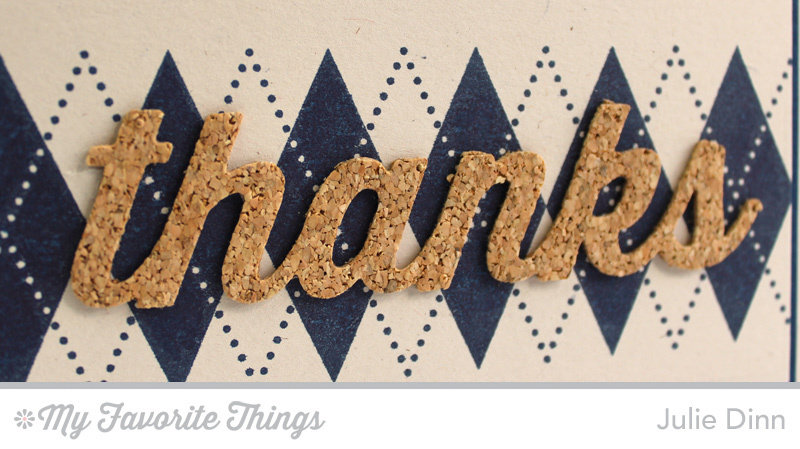 On the inside of the card, I stamped a simple sentiment from the Thankful Thoughts stamp set. Thanks so much for joining me today. Be sure to check out the MFT Blog to see all the gorgeous creations the rest of the design team has to share with you.